This text draws on the special study, Équations d’investissement : une comparaison internationale dans la crise [Investment equations : an international comparison during the crisis], which accompanies the 2015-2016 Forecast for the euro zone and the rest of the world. 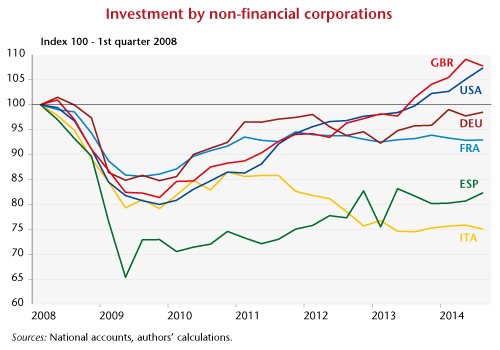 The collapse in growth following the subprime crisis in late 2008 resulted in a decline in corporate investment, the largest since World War II in the advanced economies. The stimulus packages and accommodative monetary policies implemented in 2009-2010 nevertheless managed to halt the collapse in demand, and corporate investment rebounded significantly in every country up to the end of 2011. But since 2011 investment has followed varied trajectories in the different countries, as can be seen in the differences between, on the one hand, the United States and the United Kingdom, and on the other the euro zone countries, Italy and Spain in particular. At end 2014, business investment was still 27% below its pre-crisis peak in Italy, 23% down in Spain, 7% in France and 3% in Germany. In the US and the UK, business investment was 7% and 5% higher than the pre-crisis peaks (Figure). Our study estimates investment equations for six major countries (Germany, France, Italy, Spain, the UK and USA) in an effort to explain trends in investment over the long term, while paying particular attention to the crisis. The results show that using the traditional determinants of corporate investment – the cost of capital, the rate of profit, the rate of utilization of production capacity and business expectations – it is possible to capture the main developments in investment for each country in recent decades, including since 2008. Thus, since the onset of the crisis, differences in decisions on taxation and on how tight to make fiscal policy and how expansive to make monetary policy have led to differences between countries in terms of the dynamics of the economy and real capital costs and profit rates, which account for the current disparities in corporate investment. ← Save Greece by Democracy!